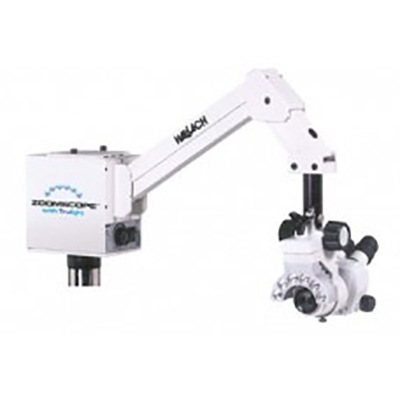 Wallach’s premier colposcope offers unobstructed access to the examination site, allowing for optimal viewing. Zoom knobs conveniently located on both sides of the optical head with vertical and horizontal optics adjustment capabilities. Nikon stereoscopic optics with continuous variable zoom magnification of 4.5x to 20x makes the Wallach ZoomScope Colposcope an excellent choice. Continuously view at the highest magnification without over or under sizing the viewing field. ZoomScope features a unique overhead suspension system that provides unobstructed access to the operative site. It may also be converted to an operating microscope. ZoomScope offers optional foot pedal power zoom and focus to free both hands. USB video and digital patient management capabilities are available for transfer to EMR systems. The legendary ZoomScope offers unparalleled image clarity combined with what appears to be a 3D image for outstanding diagnostic performance. With zooming magnification optics, you see exactly what you want. Combined with Trulight, the color and brightness of the images are outstanding. Wallach’s revolutionary Trulight Lighting System incorporates 5 high intensity, long life (20,000+ hours) light emitting diodes (LEDs) designed around the objective lens. The white solid state LEDs provide light at 5000-6000 K for a brighter white. Precisely angled, the lights converge to the target offering a brighter, white light for true tissue color. The center light is green and can be turned on at the touch of a switch for delineation of vascular patterns. The LEDs eliminate the need to change light bulbs! 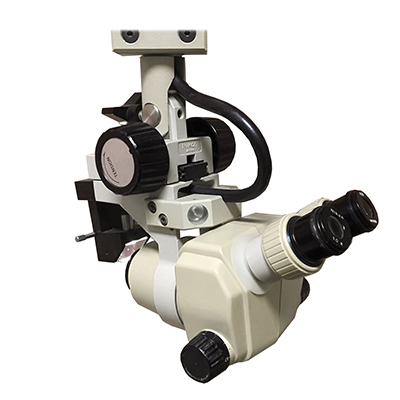 The TriScope is a highly versatile triple magnification stereoscopic colposcope. A magnification of 8x, 13x, and 21x is obtained with the 3-step magnification changer. The field of view diameters are 24mm, 15mm, and 9mm. A vessel delineation filter (green light) is incorporated to provide clear visualization of vascular patterns. The optical beam splitter permits the attachment of the co-observation tube and photographic accessories for documentation purposes, thereby extending the capability of this instrument from routine gynecologic examinations to gynecologic research. The image obtained through the accessory ports is identical to that viewed through the binocular tubes via the optical beam splitter. Photographic documentation capabilities include video and digital photography. High power white light emitting diodes allow user to view images in pure white light. A green LED will be used to pick up blood vessels. The TriScope is mounted on a 4 or 5-legged base for stability and maneuverability. Your Colposcope with Trulight is adjusted and tested just prior to leaving the factory. The colposcope arm may be moved into any position and should remain in place. However, further arm adjustments may become necessary. A 5/64 Allen wrench is included. Find set screws (two pair) on the long part of the arm. Tighten these set screws 1/8 turn at a time with a 5/64 Allen wrench by turning the screws clockwise. The arm movement may be set to a desired tension by using these screws. All retaining screws should be tightened the same amount (refer to instruction card on column). Find set screws on the short part of the arm. These screws should be tightened 1/ 8 turn at a time with a 5/64 Allen wrench by turning clockwise. The back and forth motion may be set to a desired tension by using these screws. All set screws should be tightened the same amount. The Colposcope with Trulight requires a 100-240V ~ 50-60 Hz power source to operate. It is supplied through a 2.5-meter medical grade detachable cord in standard 120 volt versions. For your safety, assure that your electrical outlets meet code regulations. The master power switch is located on the side panel of the electronics box assembly. This switch turns the main power source on or off. The switch on the front panel turns the light from white to green and back. (The middle setting is for “O”, the IEC symbol for OFF.) The knob on the front panel controls the light intensity. 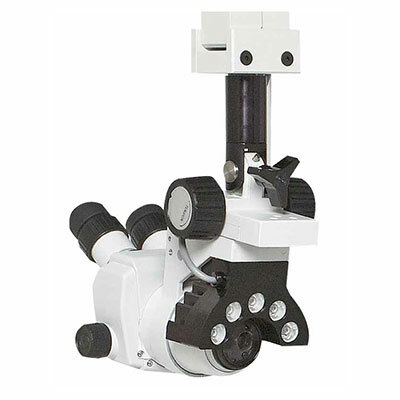 To move the Colposcope with Trulight from room to room, release the locking casters, unplug the power cord from the outlet and position the microscope head away from the direction of movement. Grasp the column with one hand and the scope with the other and push the colposcope to its new location. For added stability, it is best to position the suspension arm directly over any one of the legs as it is being moved. 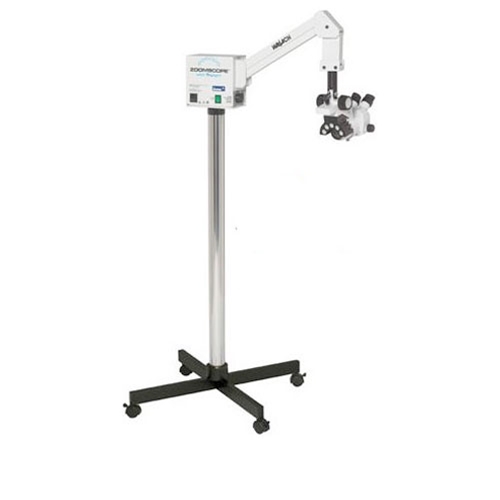 Set the Colposcope with Trulight in front of the examination table so that one leg is perpendicular to the table and in line with the suspension arm. Each leg is equipped with a locking caster. To lock the caster, push down. To unlock the caster, push up. PRECAUTION: DO NOT IMMERSE EQUIPMENT COMPONENTS IN LIQUID; UNPLUG BEFORE CLEANING; DRY BEFORE USE. Clean the lenses and protective light covers with silicone-treated lens tissue paper ONLY. The colposcope finish is a high-gloss enamel and may be wiped down with a disinfectant. Keep the instrument clean and dust-free. When the colposcope is not in use, replace protective covers.